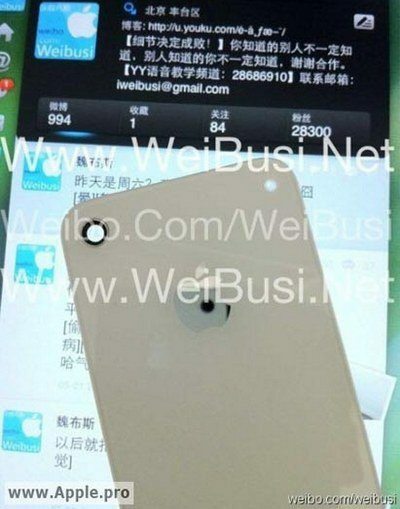 There seems to be some buzz around the iPhone 5 having its camera flash repositioned as we have previously reported, and also reported on a possible reason for the moving of the flash on the next iOS smartphone, and now a new image has hit the next which is purportedly of the rear of an iPhone 5 that shows the device with a repositioned flash. According to the guys over at Phone Dog by way of Macrumors, the new image posted by Apple Pro and apparently originating from Chinese site Weibo, is said to be that of the iPhone 5 back and has the flash over on the right side and the camera on the left. Having said all that, as you probably know images such as these are easily faked but does tie up with previous rumours that the iPhone camera flash might be repositioned in the upcoming handset, so it could be plausible. So the usual applies with this, treat firmly as pure speculation until such times as some confirmation comes along one way or another, full image can be seen below.